Demand Five instead of BBC iPlayer? Sony and FIFA are best buddies. Not only is the Japanese company filming 25 games at the current tournament in 3D in preparation for a 3D Blu-ray disc, but the World Cup and Champions League sponsor has chummed-up with FIFA and is offering World Cup goals galore on its latest 'smart' Bravia LCD TVs. 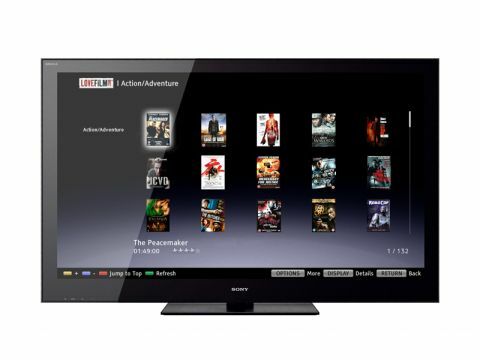 Present on its new NX803, EX703 and HX703 TV ranges, its success is largely down to presentation – it's based around the Xcross Media Bar found on the PlayStation 3. The interface is a winner; scroll across to 'video' on the XMB – which floats nicely over the live channel you're watching – and icons for each widget are presented as a list. The front-end of each and every widget is almost identical, presented in a grid of thumbnail images that makes good use of the screen real estate – and crucially makes it easy to navigate. Each icon either leads straight to the content, or to a further grid of thumbnails beneath. Content isn't too bad, either. With on-demand programmes from Five, streamed movies from LoveFilm and a special FIFA widget stacked with World Cup goodies, it's a highly attractive proposition for some, though many of the other widgets are lazily US-centric (the whole service is delivered via Sony USA). The quality is also good; the TV streams from websites dynamically, delivering a lower-resolution picture if the speed of the network slows down, and upping it when it's fast. That helps cut out pauses and on-screen buffering messages, though that's also helped by the TV's seven second video buffer.